Click here to go back to DeltaMagnatude's hub. The first photo is currently a placeholder and will be replaced once I find my old copy of Plants vs. Zombies: Garden Warfare. Due to standard protocol, all dates have been reformatted to DD/MM/YYYY. Apologies for any confusion prior to edit ██/██/2019. SCP-AAAA and SCP-AAAA-1-2 in containment. 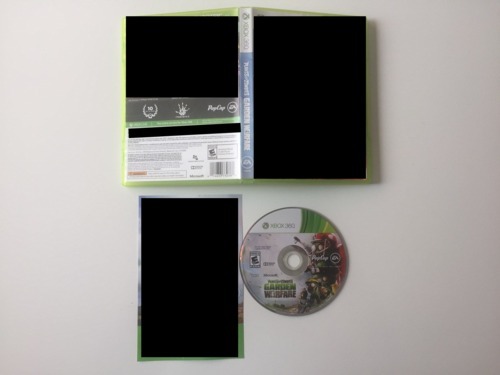 Cover of SCP-AAAA and the booklet it produced have been censored due to a memetic effect that gave viewers an urge to purchase Plants vs. Zombies merchandise1. Special Containment Procedure: SCP-AAAA is to be kept in a secure video archive located at Site-204, with SCP-AAAA-1 instances kept inside SCP-AAAA. Every week, SCP-AAAA should be checked for any changes in its book cover. During testing, D-Class personnel should be tasked with watching any videos produced by SCP-AAAA-1 instances to minimise the risk of a memetic/cognitohazardous agent affecting Foundation staff. Ongoing efforts to detain PoI-AAAA-1, -2 and -3 are ongoing. Description: SCP-AAAA is the designation of a DVD box labelled "The Full Franchise of Plants vs. Zombies". SCP-AAAA has no notable anomalous properties, other than containing SCP-AAAA-1 instances. As of 05/05/2019, SCP-AAAA creates a new image every week in its cover box, often containing messages attempting to convince readers to buy (usually non-existent) merchandising of the Plants vs. Zombies franchise. When not producing these messages, it will instead provide commentary of the franchise's 5th of May 'birthday', stories of the characters from the series, sponsorships from various companies, and sensitive information on multiple Groups of Interest and the Foundation itself included. It is currently unknown whether SCP-AAAA is sentient/sapient, or how it obtained extremely sensitive information regarding the Foundation and other Groups of Interest. SCP-AAAA is fragile and can be broken easily, but slowly repairs itself over a period of three days. If SCP-AAAA as a whole is completely destroyed, it will re-manifest approximately 2.5 minutes later, near to the area where it was initially destroyed. 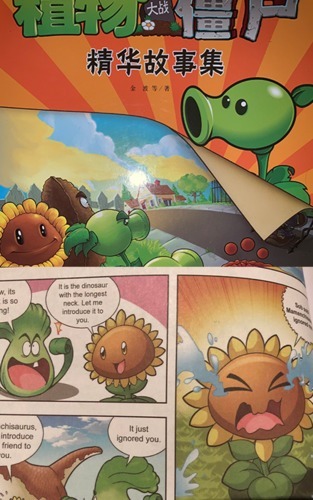 Top of image: a Plants vs. Zombies comic book produced by SCP-XXXX. Bottom of image: The contents of another PvZ comic book also produced by SCP-XXXX2. If any of the SCP-AAAA-1 instances are inserted improperly or do not meet the aforementioned requirements, the instances' secondary anomalous properties will activate. The discs will begin running an existing, defunct, unreleased, region-exclusive or normally incompatible Plants vs. Zombies game3. When requirements are met, SCP-AAAA-1 instances display a list of seasons and episodes for a non-existent animated cartoon show of Plants vs. Zombies4. The contents of each season details the lore of Plants vs. Zombies, though later in the series the episodes begin to heavily deviate from its original light-hearted tone, along with its art style and the topics involved5. In extremely rare occurrences, SCP-AAAA-1 may display a single episode not included in the regular main list. These rare episodes are usually hour-long documentaries of Neighborville, detailing the history, ecosystem, wildlife and agriculture of the location. Reports of a Plants vs. Zombies fan under the alias of "Jukie Zubrains6" (real name ███████ ██████) claiming to have footage of Plants vs. Zombies: Garden Warfare 3 reached Foundation interest, leading to the deployment of several undercover agents to locate the individual. ███████ ██████ was found in her apartment in California. During an interview conducted by the agents, she provided SCP-AAAA and the SCP-AAAA-1 instances within it, claiming to have discovered the objects in a dumpster near her apartment. She mistook the anomalous discs to be used copies of various Plants vs. Zombies games and had planned to do a giveaway on her Twitter account. When she inserted SCP-AAAA-1-3 into her PS4 console, she accidentally activated the secondary anomalous effects of the disc, which she interpreted as having accidentally obtained the third instalment of the Plants vs. Zombies: Garden Warfare spin-offs. After the interview, ███████ ██████ were 'arrested' by the agents with the coverup reason for stealing intellectual property from PopCap and Electronic Arts Incorporated, before being administered Class-A amnestics and administered minor Class-F fugue amnestics for reconstruction of previous memories. Cover changes: An illustration of Plants vs. Zombies, celebrating the franchise's 10th birthday. When removed from SCP-AAAA and held by an individual, the subject reported hearing the official Plants vs. Zombies song "Zombies On Your Lawn" emanating in the background. The illustration has been archived as a minor anomalous item. Notes: First recorded anomalous change to SCP-AAAA box cover. Description and Containment Procedures updated since. Cover changes: A large collection of Plants vs. Zombies comics published by Dark Horse Comics7 were recovered from SCP-AAAA. Interviews with the publishers revealed that most of the comics found from SCP-AAAA were currently still in the planning and storyboard stages. Notes: SCP-AAAA was damaged by the overwhelming amount of comics that manifested within it. SCP-AAAA repaired itself shortly after the event occurred. Cover changes: A leaflet pertaining information of sponsorship of the Plants vs. Zombies franchise by GoI/PoI Dr Wondertainment, with an address leading to an office in Seattle owned by video game company PopCap. Notes: Current and former PopCap employees reported no anomalous occurrences during their time in the Seattle office. Cover changes: A 3-page shopping category for non-existent Plants vs. Zombies merchandise. Analysis of the category revealed hidden text written by the character Dr Zomboss, detailing his scheme in funding his ventures via merchandising. Notes: A subsequent investigation into a connection between GoI Marshall, Carter, and Dark Ltd. and SCP-AAAA directed towards a purchase made by PopCap's parent company Electronic Arts Incorporated for several Prometheus Labs assets. EA is currently under Foundation surveillance for any more of these purchases. Cover changes: A vintage photograph of four unidentified individuals wearing 1968 U.S. uniforms. A fifth unidentified figure in the background can be seen wearing a South Vietnamese Army uniform. The writing on the back of the picture reads "Saigon, 1968". Notes: The picture later shifted into a photo of the characters Super Brainz, All-Star, Engineer, Scientist and Foot-Soldier taking a group photo, with the writing on the back replaced with "Sharkbite Shores, 2019". It is currently unknown what the previous photo has to do with the Plants vs. Zombies franchise or its creators. Scans of the original vintage photo still exist in Site-204's archives. SCP-AAAA also produced a new photograph along with the previous image's change; the new image depicts Plants vs. Zombies characters Nate Timely and Patrice Blazing being arrested by Zomboss' troops. Writing on the back of the new photo reads "Arrested for conspiring with the Plants and involvement in un-American activities". Cover changes: A single piece of paper filled with racial derogatory terms and death threats directed towards Foundation Field Agent Raju, a Foundation field agent. Notes: No explanations could be made on why SCP-AAAA became aggressive towards Agent Raju in particular. It is believed that this could be due to Agent Raju having negatively criticised Plants vs. Zombies 2: It's About Time prior to SCP-AAAA's discovery. Notes: Cover contained sensitive information on the [REDACTED] Department of the Foundation. All personnel with a clearance level lower than Level 4 who viewed the cover were immediately amnesticised. Cover changes: A five-page book demanding that Foundation personnel should destroy GoI Gamers Against Weed before "it's too late". The last page of the book details the location and private information of every individual that is affiliated with the group, with the exception of their leader "bones". Senior Researcher Atharva's notes: Looking back at this, I personally believe that whoever's writing these messages were trying to tell us about SCP-4669, an anomaly neutralised on 05/05/2042 by an unknown force. It's possible that SCP-AAAA acts as a sort of message transmitter that is spread across time, ranging from the past and into the future, but that doesn't explain why SCP-AAAA keeps asking us to buy Plants vs. Zombies toys in return for sensitive information, nor why it targets specific individuals for not enjoying certain Plants vs. Zombies games. Extraneous testing with lackluster results has been omitted. Testing Procedures: Insert SCP-AAAA-1-1 into an XBOX ONE. Results: The XBOX version of Plants vs. Zombies began playing at an extremely low resolution. Testing Procedures: Insert SCP-AAAA-1-1 into a 1984 Macintosh computer. Results: A PC version of Plants vs. Zombies began playing and appears to suffer from no performance issues. Notably, audio has been edited to be slower than normal and a light-purple tint filters the screen during gameplay. Testing Procedures: Insert SCP-AAAA-1-3 into a 2008 Acer Aspire 3830T laptop. Results: SCP-AAAA-1-3 caused the laptop to become permanently disabled, presumably due to SCP-AAAA-1-3 attempting to run a Plants vs. Zombies game that required a high-end GPU. Testing Procedures: Insert SCP-AAAA-1-1 into a PS4. Results: Plants vs. Zombies 2 began playing on the PS4 as a widescreen version. Frame rate per second during gameplay topped at 2000 frames per second, which is normally unachievable on the PS4 console. Testing Procedures: Insert SCP-AAAA-1-3 into a custom-built Foundation console, designed to be more powerful than current-generation consoles. Results: The third instalment of the Plants vs. Zombies: Garden Warfare series began playing. Multiplayer servers were unavailable, though a single-player campaign was playable. The date in-game is set to ██/██/20██, presumably the day the game is set to be released to the public. Testing Procedures: Insert SCP-AAAA-1-3 into SCP-3922. Results: An SCP-3922-A instance stands on top of a stage, wearing and holding Chinese bootleg merchandising of Plants vs. Zombies. For the next 3 minutes, the entity chastises Agent Venitha, Raju and Pryce8 for pirating the third instalment of Plants vs. Zombies: Garden Warfare. The SCP-3922-A instance's body language begins to slowly change throughout the duration of the video, appearing to be fearful or nervous of something or someone. At the end of the video, the camera pans to the seats of what appears to be an auditorium, filled with a large number of Plants vs. Zombies characters, all looking dissatisfied. It then fades to black, with the end title card appearing with the captions: "IT APPEARS WE, THE ☽☽☽, HAS MADE A MISTAKE. THE GAME MENTIONED DOES NOT EXIST (YET). WE DEEPLY APOLOGISE FOR ANY TIME WASTED." Results: A short video of SCP-3922-A instances and several Plants vs. Zombies characters firing a large laser cannon aimed towards Bogal Mountain. Upon the destruction of the mountain, all characters within the scene celebrates their victory. Notes: No significant behavioural changes observed from Corbenic/Galahad related anomalies, though SCP-3768 reported a sudden rise of popularity in Plants vs. Zombies related products within SCP-2922-C, along with the ☽☽☽ Initiative launching propaganda campaigns often featuring characters from the aforementioned video game. Director Naismith's note: Cross-experimenting SCP-3922 with any other video anomalies contained by the Foundation is STRICTLY FORBIDDEN from now on. We do not need more fictional entities to end up becoming a threat to the world, now that the ☽☽☽ Initiative has access to EVEN MORE WEAPONS. Most summary log has been omitted due to issues with length. Summary: The episode is an adaption of the Plants vs. Zombies comic "Lawnmageddon", with the addition of a new character called "Jonathan", a minor character whose only role for the entire show is to be a sort of 'running-gag' of the series. Otherwise, the episode follows the same plot as the original comic book. This episode lasts for an hour in order to fulfil every event depicted in the original comic, with some minor changes. For information on the original story, view Document AAAA.1 Section 1: Plot. Summary: The episode begins with a single shot of Nate Timely sleeping in his treehouse, and it is the only scene in the entire episode. Patrice Blazing is heard attempting to contact Nate Timely's phone to warn him of a Balloon Zombie attempting to break in through the tree house's window, however, Nate had sealed it off using duct tape and pieces of wood. Halfway through the episode, Patrice stops attempting to call Nate's mobile phone. The episode then proceeds to fast-forward all the way to the morning, which at that point the Balloon Zombie is heard giving up in frustration and retreating. Nate Timely wakes up, unaware of what had happened during the night. Summary: As fog season covers Neighborville, Crazy Dave dresses up in a ghost costume and hides in the fog to scare citizens, and is seen attempting to scare Zomboss. As the episode ends, Crazy Dave takes off his cooking pot he uses as a safety precaution against Zombies and proceeds to hit Zomboss in the pancreas, incapacitating him. As the doctor grimaces in pain, Crazy Dave briefly celebrates by eating a 'pocket taco' before hitting the doctor with the cooking pot in the pancreas three more times to cover his escape. As Zomboss struggles to stand up, he vows to eat the brain of the perpetrator, unaware it was Crazy Dave the whole time. Summary: The episode begins with Dr Zomboss using his invention, called the "Zombot" in order to wreak havoc throughout Neighborville and to capture as many humans as possible. Nate Timely, Crazy Dave, Patrice Blazing and the Plants scramble to prepare a defence plan, however, most of the Plants are too tired to perform anything productive with the exception of the population of puff-shrooms, who had spent the time awake drinking a large amount of caffeinated drinks during a party. Due to a mechanical error within the contraptions of the Zombot, a puff-shroom manages to sneak in between the openings of one of the giant robot's legs and quickly sabotage the infrastructure of the mech, causing it to blow up. As Zomboss climbs out of the wreckage, he dons on a moustache and a stereotypical French accent, declaring his 'surrender' before fleeing to parts unknown. Summary: Nate Timely, Patrice Blazing, Crazy Dave, and a sapient time-travelling truck named "Penny" returns from the Steam Ages, and begins to reflect on their time spent chasing Dr Zomboss throughout history. As they worry about Zomboss' mention of a 'Project Paradox', the doctor jumps out of a time portal, proclaiming that the quartet has interfered with history and how he'll be the one to stop them from continuing. The doctor then sends waves of zombies from across time to take on the quartet, though the Plants are able to fend off the attackers. Zomboss is angered by this failure and decides to reuse his giant Zombot machine to defeat his opponents for once and for all. Due to a malfunction, however, the robot is instantaneously struck down by a stray pea fired by a Peashooter. After Dr Zomboss surrenders, the Plants celebrate their victory. Title: "Edgar George Zomboss: A documentary on his tyrannical rise to power"
Summary: A poorly-produced documentary on Dr Zomboss supposedly created by Nate Timely and Patrice Blazing, two characters originating from the Plants vs. Zombies comic spin-offs. The 'episode' appears to be a propaganda film than an actual and non-biased documentary, with Nate constantly insulting Zomboss for a variety of silly reasons9 and Patrice advocating for a ban on necromancy and thanatology10. Notes: SCP-XXXX later produced a letter attempting to convince readers to watch more documentaries related to Neighborville. Summary: A documentary on the marine life of Neighborville. Title: "Thanatology and Botany11 - Bringing a Future World for the 51st State of America, Aprait"
Summary: A five-part documentary (each part having a duration of at least two hours) on the history of Neighborville transitioning to "Aprait", and topics relating to Thanatology and Botany. The documentary was created by an individual named "Daniel Greene". Notes: After the viewing of the fifth part of the documentary, SCP-XXXX produced a 200-page autobiography supposedly written by Plants vs. Zombies character Super Brainz. The character refers to itself as Daniel Greene and claims to have served three tours in the United States Marine Corps during the Vietnam War. The veracity of this statement is currently under investigation. On 04/29/2018, George Fan, now classified as PoI-AAAA-1, came under Foundation attention after witnesses reported PoI-AAAA-1 attempting to communicate with a non-anomalous octopus. PoI-AAAA-1's house was eventually raided by Foundation agents after the Person of Interest committed a series of anomalous events while under Foundation surveillance, though the household was abandoned by the time the raid was conducted. The following text messages were recovered from PoI-AAAA-1's phone, who had left it in their bathroom. Can you pick the phone up? Do you feel like you're being followed as of recent? What does the foundation have to do with this? Remember how before we were laid off from popcap we were working on that pvz theme park in Wyoming? They've found it, havent they? How'd they find something so insignificant in the dumpsters? So it was Jukie who found it. Then the Foundation tracked her down? As of the discovery of these text messages, Rich Werner and Laura Shigihara has been designated as PoI-AAAA-2 and -3 respectively due to their affiliations with multiple GoIs and PoI-AAAA-1. Although all three Persons of Interest are still at large, they're still active on their social media accounts, usually posting from untraceable locations. A raid conducted on Electronic Arts Incorporated's main headquarters and PopCap's Seattle office on 06/██/2018 recovered several archived files mentioning projects of creating an extra-dimensional space, with the purpose of using it to build a Plants vs. Zombies-themed amusement park within this extra-dimensional space. If the veracity of the documents can be confirmed to be legitimate, then PoI-AAAA-1, -2 and -3 were fired from PopCap for interfering with the timeline of the universe, instead of the widely believed reason of PoI-AAAA-1 refusing to implement micro-transactions into the Plants vs. Zombies games. As of the discovery of these documents, it has been hypothesised that an extra-dimensional space located in Wyoming is harbouring a significant amount of partially contained anomalous objects. Due to the risk of civilians accidentally discovering this new anomaly, efforts to locate this extra-dimensional area are ongoing at a top priority. Electronic Arts Incorporated and companies acquired by the business are currently under Foundation surveillance for any anomalous activities. Due to the risk posed by PoI-AAAA-1, -2 and -3, capturing them are considered a top priority. 1. 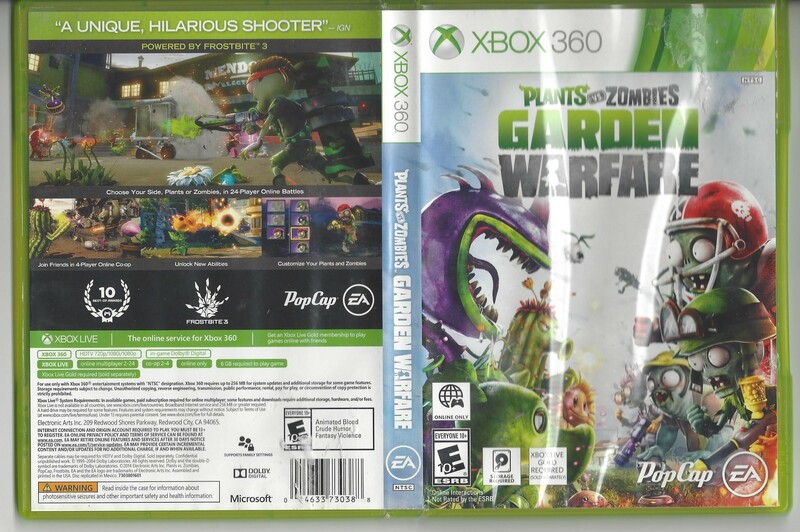 The cover shown had an appearance identical to the covers seen on physical copies of Plants vs. Zombies: Garden Warfare, as seen here. 2. Foundation staff later identified that these types of comics produced by SCP-AAAA were near-perfect copies of unlicensed Plants vs. Zombies comics originally produced in China, though SCP-AAAA instead created badly translated versions of said comics. 3. Examples includes the unreleased Talking Zombatar, a digital version of Plants vs. Zombies: The Board Game, Plants vs. Zombies Adventures, Plants vs. Zombies Pinball, the unreleased third instalment of the Garden Warfare series, and spin-offs exclusive to China. 4. Undercover interviews with Electronic Arts Incorporated and PopCap employees revealed that plans to create a Plants vs. Zombies show were apparently scrapped during concept phase, due to lack of ideas and originality. 5. Episodes beginning from Season 1 are more comedic in nature and take on a more cartoonish art style, with nonsensical topics involving the importance of tacos. Episodes beginning from Season 6 has a more cynical tone and a gritty 2.5D art style, with topics involving interrogation, mourning, death, and the advocacy for nationalism and patriotism for the United States of America. 6. ███████ ██████'s online username. 7. Dark Horse Comics is a comic book publisher originating from Oregon. 8. These agents were responsible for retrieving SCP-AAAA. 9. Reasons included but not limited to: Attempting to bar Crazy Dave from retrieving a taco with a waffle on top, loitering in Plant territories, and eating a burger containing a small piece of lettuce. 10. the scientific study of death. 11. The study of plant life.